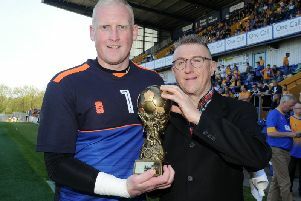 Having had more than his fair share of heartache alongside his glories, former Mansfield Town star Adam Murray is the ideal man to pass on football and life skills to youngsters. So it’s no surprise he has found a home for his vast experience in looking after Barnsley’s U18s at Oakwell. The Stags legend, who had three spells with Mansfield as a player and also managed the club, was twice promoted with Stags but early in his Derby County career ended up battling alcohol addiction in the Priory Clinic as the tender age of 21. “I’d like to think I have a lot of strings to my bow in all bases and areas, not just on the pitch but off the pitch as well,” he said. “A lot of the hurdles young players face do come in society and not necessarily on the football pitch. “Obviously as a young player I had a lot of challenges I had to overcome myself and find ways to do that. “So I have a decent set of skills that I hope along the journey in this role I can help the young lads needing advice on different situations or overcoming obstacles they are facing. I feel I am qualified to do that. Murray said he had to be careful what he told players and when. “I think if I actually started on some of my stories it would shock a few of them,” he smiled. “You try to put your experience and knowledge in at the right time. I have four kids myself so I know what they are like. “It’s important you pick the right moment and the right experiences to share as some experiences are not relative to certain individuals. “You have to be careful and aware of what every individual needs. Murray’s new role is certainly a departure from his past jobs. “It’s a little bit different to what I’ve been used to over the last few years, but I am managing to do bits with the U23s and the first team as well as the U18s, so it’s keeping me connected across all the different age groups,” he said. “It’s a different kind of pressure, but still a pressure to produce so I am enjoying it. “Don’t get me wrong - I do miss the buzz of three points on a Saturday afternoon at times. But you get something very different out of this role. He added: “In this role it’s a little bit more of a wider vision and you are looking at longer term goals and it’s a month or a year’s work rather than week to week. “It’s more about the process that goes into becoming a footballer rather than the process that goes into winning three points.